The three-day Swop Shop painting event in Stanford was a truly communal effort. This collaboration between youth, community organisations and a collection of local artists set the standard for future celebrations and events. It is clear that Stanford faces challenges and when people come together to work together, it shines a light on how we can develop our village and its people while being creative and having fun. Elma Hunter, who runs the SCORE Swop Shop in Stanford called on all of us to come together as a community to beautify the swop shop space. Local artists Beatrice Pook, Sanette Upton, Ntando Sebele, Herfsfees and Creative Works collaborated for this event. We want to thank all the artists, children and everyone involved. These collaborations are wonderful opportunities to uplift communal space and for our community to work together and share our achievements. We look forward to growing support in many more of these community building events to come. On Day One we painted the containers in all the colours of the rainbow by mixing and experimenting with paint with the Stanford children and community members. Everyone gathered and with brushes, sponges, hands, pieces of cloth and whatever we could gather the space was transformed into beautiful, exciting splashes of colour reflecting the mood of the day. The kids were free to express themselves in colours and we also had some adults joining in the fun. The HA!Man blessed us with the sounds of his cello and was joined by an impromptu percussion session by the children. Fred Kayman from Hermanus offered some movement activities in the hall. Many thanks to David Morani who captured the event on film. This day is reflecting our vision that we, as a community, want to come together to celebrate, educate and grow as people. 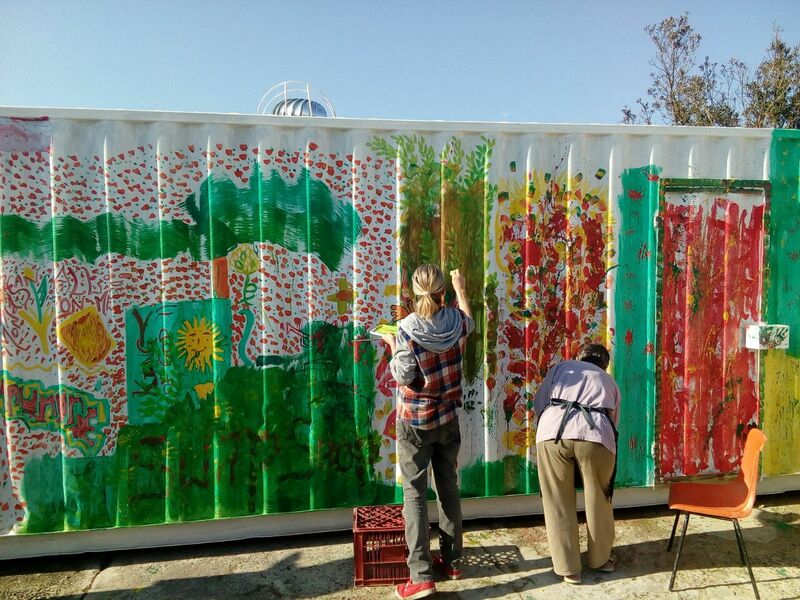 On the second day, the artists of Stanford joined in to transform the colour formations on the containers into art pieces. Many thanks to Beatrice Pook, Sanette Upton, Ntando Sebele, Marian Binder, Val Myburgh, Tracy Algar and everyone involved. On day three the outside wall was painted by the Stanford Conservation Trust and community members. Many thanks to the Conservation Trust. This event was a truly communal effort which left all with a feeling of friendship, support and how working together can transform a space on the outside as well as our inner landscape. The SCORE Swop Shop is a local initiative were children can bring their collected recyclables and exchange it for clothes, stationery, books or educational toys. Please contact Elma on 082 892 9507 if you want to get involved or donate any items to SCORE. Support us in many more of these community building events to come. Thank you Sanette and Ntando for the beautiful photos of the event.